Sydney based Ozsun’s External Ozsun External Shutters are made from reinforced extruded aluminium, and are available in a full range of powder-coated colours to meet Australian Standards. They are hard wearing and easy to clean. 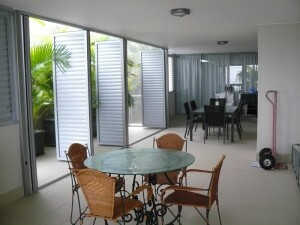 Ozsun External Aluminium Shutters are ideal for decks, patios, balcony’s, court yards and wet areas, and can be installed horizontally or vertically. Our aluminium aero-foil blades keep out the hot sun and rain, but give you control over air flow and light, while maintaining security and privacy from neighbours. Ozsun External Aluminium Shutters can span widths up to 1800mm wide, and have a unique shutter blade spline for added strength, a rack and pinion system for even weight distribution, and a tension system for windy areas. Options such as sliding, bi-folding, hinged or fixed give great flexibility for different installations. Your Ozsun Shutters will provide durability, and un-like timber and poly type products, they resist chipping, peeling, cracking, sagging, splitting, warping, and probably won’t require painting for 20 years. 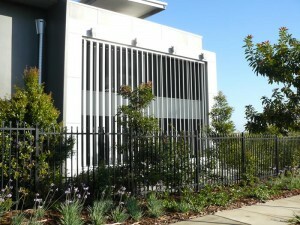 Ozsun Aluminium Shutters are Australia’s most affordable external shutters. It’s built for Australia’s harsh conditions – engineered to last – and offers very low maintenance.